Gallium nitride is a major semiconductor compounds widely used for micro and opto electronics applications. In spatial or medical environment, the GaN based devices experience electronic irradiation or ionic bombardments which induces atomic displacements in the GaN crystal. This creates a large amount of vacancy defects and interstitials atoms (Figure I), which are detrimental for the electronic properties of the devices. Surprisingly , in spite of many studies in the past few years, no defect associated with the nitrogen sublattice could be experimentally evidenced. 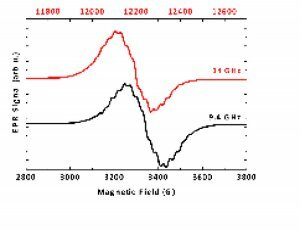 Recently, two researchers of the Confid-INSP team made an important breakthrough by coupling experimental results obtained by Electron Paramagnetic Resonance spectroscopy with theoretically calculated parameters of defects (Figures II and III). a) Schematic of an elastic collision between an incident particule (orange) and a nitrogen atom (blue) of the GaN crystal. 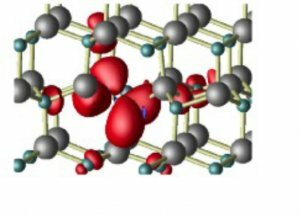 We focused on Nitrogen vacancy defects and interstitial Nitrogen atoms produced by elastic collisions with protons, electrons and high energy ions. 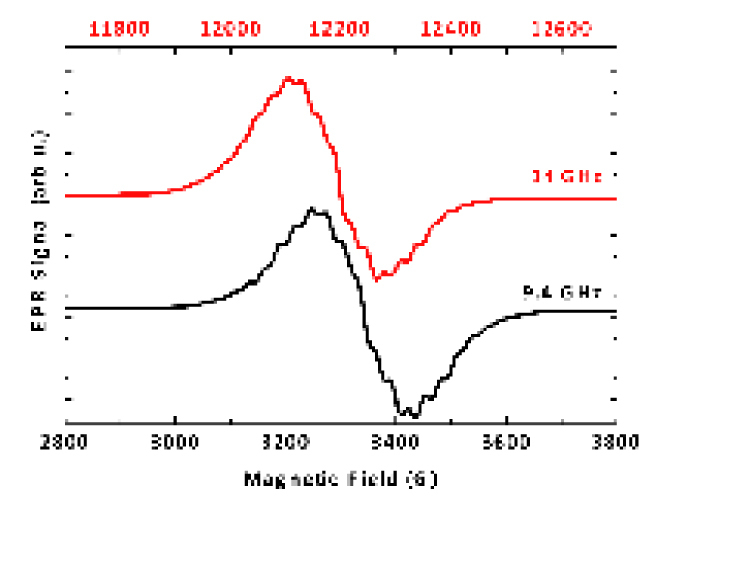 By tuning the irradiation conditions and the initial doping of the samples, and by taking advantage of positron annihilation spectroscopy, we have experimentally evidenced Nitrogen vacancies. We have shown that the interstitial Nitrogen atoms get paired even at room temperature and localized at a Nitrogen site. This type of defect looks like an atomic dumbbell and is well known in other high gap semiconductors like diamond or silicon carbide. We have observed that the thermal stability of these dumbbells is weak : a thermal annealing at 400°C induces a structural change which could be the first step of an important structural modification. Drawing of the paramagnetic electronic spin density (red) around the dumbbell. This result questions the previous interpretations of the irradiation induced degradation of the electrical performance of the devices based on GaN. Further studies are required to determine the exact impact of the identified defects on the modification of the electronic transport in the devices under irradiations.